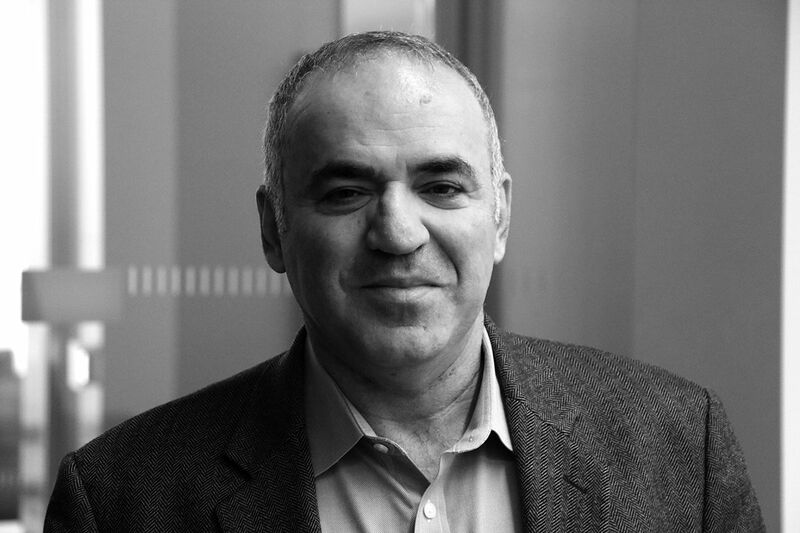 Garry Kasparov had a busy spring and summer of 2017 in which he recorded his MasterClass and then participated, after a 12-year absence from competitive chess, in the Saint Louis Rapid & Blitz tournament. While he’s been on television much recently to discuss politics, his passion is still the game that made him famous. In an exclusive interview for Chess.com, he speaks about all manners relating to chess. The interview was conducted in late December in Kasparov’s new office atop a New York City high-rise in midtown Manhattan. He was clearly excited, as afterward h, had planned to show two chess positions left on the MasterClass cutting room floor, but he ended up analyzing two of his games, and showing two of his favorite studies (those videos to follow soon on Chess.com). The first topic was Kasparov’s MasterClass, and how he prepared for the production. He had many positions, games, and studies that were left out of the final product, and those factored into the discussion as well. I have to confess that I wasn’t sure from the beginning. I watched, of course, Steve Martin, Serena Williams, I could see the highest quality of production… But how to squeeze my knowledge of the games of chess, my experience, my passion for the game in six, seven, eight hours, whatever will be the final product? And also, what is the target audience? There are so many people that like to hear what Garry Kasparov is going say about chess and this crowd will be ranging from total beginners to very decent, strong players. I’ve been contemplating my message, how could I create something that could be of interesting for as large an audience as possible. I decided that it’s not about being very precise with some tactical tricks, even strategical concepts because there are so many of them. It’s just trying to give the gist of what I think is important for people to make progress. Kasparov mentioned that an Elo level of 1300-1700 was “potentially the core audience” but one thing was central for him. The most important task for me was to communicate my love and passion for the game, and also to demonstrate the beauty of the game. 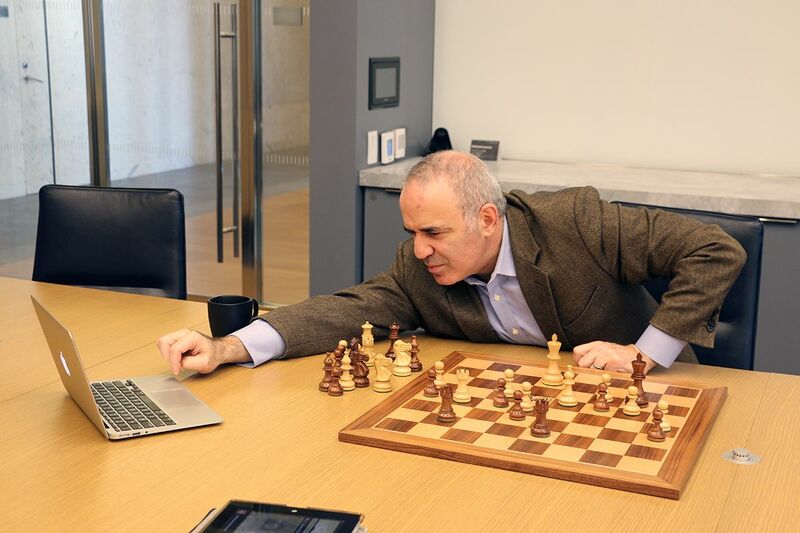 Garry Kasparov in his Manhattan office. | Photo: Mike Klein/Chess.com. Usain Bolt is not going to compete with Mercedes Benz. Even though computers are now much stronger in chess or virtually in any other video or board game, it doesn’t stop humans from competing against each other but most importantly, to enjoy the beauty of the game. And sometimes you can use machines to help you to create beautiful studies. Many of the best studies in the last decade have been created with the assistance of the computer. I wanted to present this multidimensional beauty of the game. Even now, 12 years after I left professional chess, I haven’t lost my ability to be mesmerized by some of the great positions. There is still plenty in the game of chess to be discovered. Any new step in revealing the secrets of the game, with new machines, new computers, new engines, I take as positive not negative because it helps me to understand this game deeper. The deeper we understand the game, the more we can enjoy it. Kasparov preparing a video for Chess.com on his game with Veselin Topalov, Linares 1999. | Photo: Mike Klein/Chess.com. The preparation for the lessons wasn’t easy. It was challenging both physically and psychologically. These days I am not used to such an intense program. That was one of the problems I experienced in St. Louis: It’s very difficult to change the algorithm that is working inside your brains to help you to meet the challenge you’re dealing with. What helped me is that I enjoyed it myself. Everyone who once made it to the very top, couldn’t make it without passion. Yes, it did. It’s not just the MasterClass itself but also the environment of St. Louis. It’s a place where I feel that playing chess is fun. While I was quite skeptical of my chances of playing well, it was hard to resist this temptation. After a few rejections of potential other wild cards to join the Grand Prix [sic] and an open invitation from Rex Sinquefield, how could I say no? 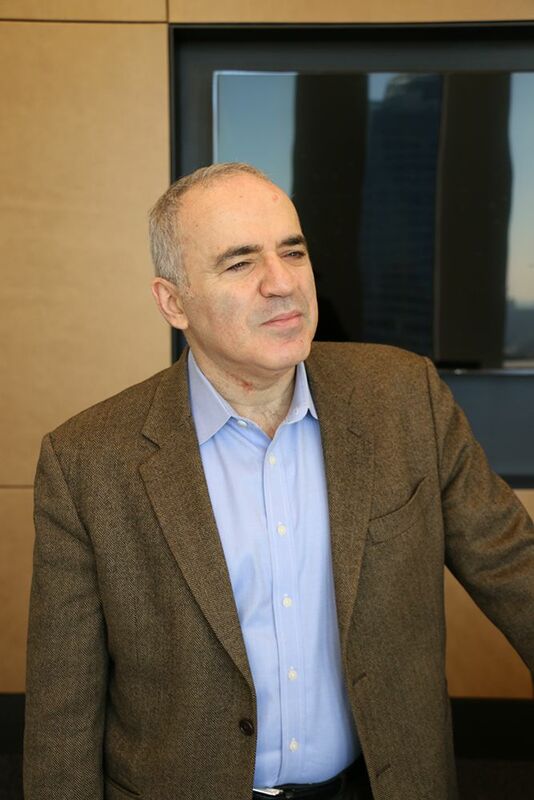 Kasparov: “Everyone who once made it to the very top, couldn’t make it without passion.” | Photo: Mike Klein/Chess.com. But for this, second major event chess in 2017 for Kasparov, the preparation wasn’t great. I knew it would require a total change of my regime and I couldn’t make it. I still had to fly back and forth, I had so many arrangements, like speaking at DevCon in Las Vegas and then I had to go back to my family in Europe, so it was not a preparation that Garry Kasparov 20 years ago would approve. In order to compete seriously against the world’s top players I probably needed two months of full concentration, maybe staying in St. Louis or even staying in Croatia, but just doing nothing else but chess, thinking about chess, and washing out everything else. It was not possible. I probably had a few weeks of preparation, just playing a few training matches. I had some ideas. Every time I go back to St. Louis, the summer of 2017, think about some of these games, it’s almost a nightmare because I got very good positions and there were several games where part of the game I played like Garry Kasparov but I don’t want to think what happened in the rest of the game! Realistically speaking, with some good preparation and with my site of mind being focused on the game I would definitely make top five… By the way, even in this horrible tournament for me, I was just one point away from top five, so maybe I could make top three. That would be realistic. Having plus one, plus two in rapid and plus three in blitz is not beyond my ability to achieve. But at the end of the day, it was not about scoring these points, it was about having fun for myself and also sharing this fun with the rest of the crowd. 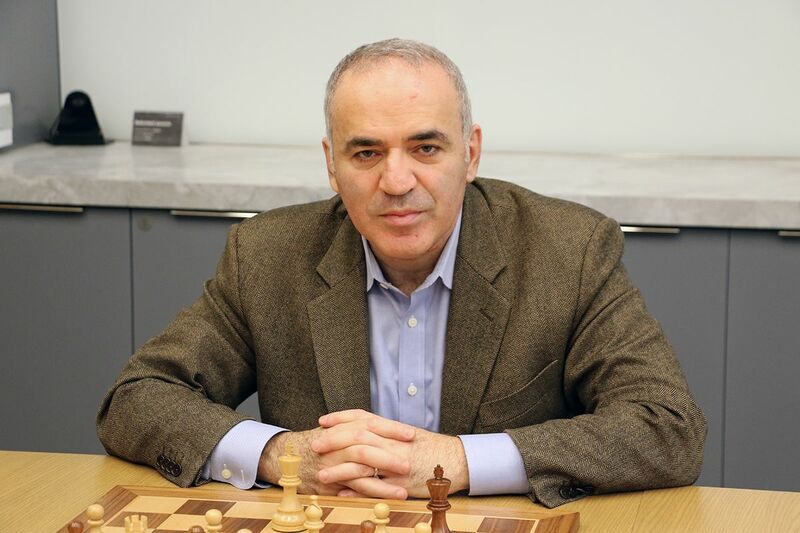 Kasparov has looked at his games in St. Louis—not too deeply, and with a computer. He said he noticed the same pattern; playing well, getting a good position, and then a blackout. There was not much to learn from the chess angle; it was more about psychology. It’s something I have to accept as the very sad reality: I am no longer just to play, even in rapid, games with the same level of concentration and dedication as before. Maybe somehow it was a conspiracy of the game of chess against me because it was probably wrong of me to go back after 12 years of inactivity and also not concentrating on the tournament, somehow it’s a punishment. If you want to play well, you have to make it a priority. A message from Caissa: You don’t want to concentrate? Fine, we’ll teach you a lesson. “It was not a preparation that Garry Kasparov 20 years ago would approve.” | Photo: Mike Klein/Chess.com. On the question that’s on everyone’s lips — Will we see him in a rated event ever again? Right now I don’t think about it. I doubt it will be next year. I cannot afford to do it again the same way as I did in 2017. If I do it again, it should be a test, what I really can do if I spend a certain amount of time to concentrate and prepare myself for this challenge of facing top players. I am not sure I have this time available. I wouldn’t say no, no, no, no, but it’s unlikely. We can learn a lot from the way AlphaZero plays. What I understand is that it establishes it’s own skill of evaluation, so set of priorities, which is quite a unique accomplishment because typically every program has this set of priorities and it’s not flexible. They maybe make slight alterations but in general, they have to stick with the original numbers that are attached to each priority in this evaluation mechanism. AlphaZero, after playing millions and millions of games, came up with its own set of values. What was most amazing was, just statistically, it’s the white and black. AlphaZero was totally deadly with white while with black it was winning but by a very small margin. Does it tell us that we misunderstand the value of the first move? There’s still a lot to learn. We’d also like to take the opportunity to show an “exclusive” (as in: not yet published) recent game by Kasparov, from a simul in Zagreb, late December 2017. It was sent to us by Kasparov’s aide-de-camp Mig Greengard, who added the comments as dictated by Kasparov himself. Black is Srdjan Darmanović, the foreign minister of Montenegro and a big chess fan who got up to a rating of around 2200 when he still played actively.